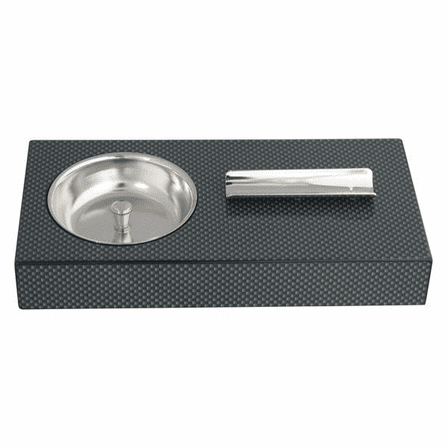 FEATURES/SPECS A unique item that will add to the look of any man cave or den, this single cigar ashtray has a carbon fiber coated finish with a steel cup for ashes. 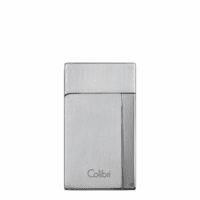 It also includes a single stirrup to hold your cigar. The stirrup is set on the top body and designed so that the lit portion of your cigar will hang over and ash right into the ashtray. The carbon fiber finish covers a wood body and is coated in a lacquer finish. 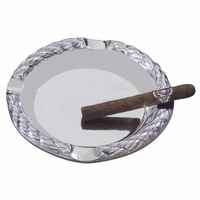 Perfect for any room you smoke in, this cigar ashtray will make your smoke break a pleasure. Dimensions: 6 1/2" x 3 3/4" x 1 1/5"